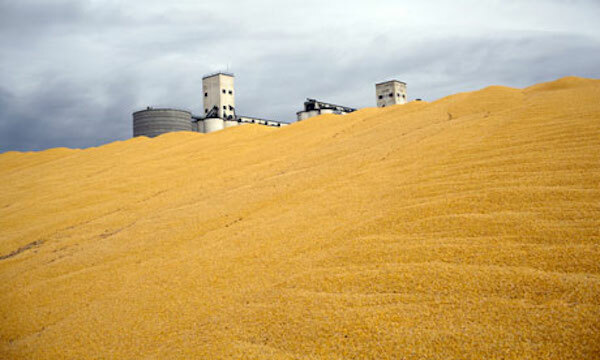 Harvested corn at a silo in Colorado. A hundred years ago, there were fewer people in Britain but many more of them were homeless. It was thought that homelessness came from there being too many people. It was a population problem. Simple as that. But then voters realised that homelessness was caused not by too many people crowding too small a country, but by too few people owning too much land. In came social housing and down – spectacularly – went urban homelessness. As with shelter then, so with food now. Today’s population panic goes on as if the Earth’s temperate grasslands are straining under the weight of supporting voracious humans rather than voracious Big Ag. According to the National Corn Growers Association, 30% of US corn ends up as fuel ethanol, while 5% is grown as corn syrup for junk food sweeteners and fizzy pop. Ain’t it grand that we’d sooner say there are too many human beings in the world than too much Coca-Cola, Honey Nut Cheerios or Special K? Food security and ecological sustainability are impossible without democratic control of land. Only through land nationalisation can we introduce the connected landscapes, smart cities and wildlife corridors that will let ecosystems bend, not break. As with homelessness a century ago, the problem facing a population of 7 billion is not too many people crowding too small a piece of land, but too few people owning too much world. via There is no population explosion on this planet | Robert Newman | Comment is free | The Guardian.